In the last Part of this series I partly analyzed the final Payload. I haven't finished the analysis of the malware due to lack of time (and interest), but I will provide as much as information I have discovered. It looks like this malware is a classic spying tool (information gathering), but it would be interesting to know who is the attacker and who are the victims. Unfortunately I don't have a chance to reveal the identity of both and speculation is also not possible since the lack of any hints. The final Payload also wasn't uploaded to Virustotal, so the detection rates supposedly are very low. We start by examing the Export functions of this .dll. 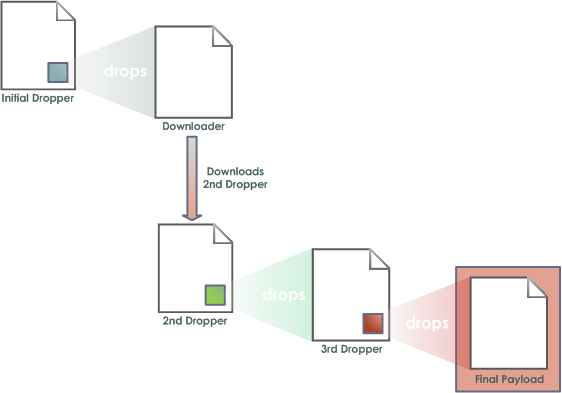 In the second Part of this series we analyze the downloaded file (2nd Dropper) and the dropped file (3rd Dropper). At time of this analysis the files weren't uploaded on Virustotal, so I guess the detection rates are very low, if at all. In this series I have analyzed an interesting malware that combines various techniques I haven't seen before. Part 1 of this series deals with the initial Dropper and the Downloader which both come in the form of a Dynamic Link Library (.dll). The initial Dropper drops and executes the Downloader (netids.dll). Part 2 deals with the downloaded file, which is just another Dropper (msmvs.exe). This Dropper drops a .dll (conhost.dll) which in turn drops the final Payload (also .dll). Part 3 deals with the final Payload (netui.dll). Note: Due to lack of time (and interest), I haven't completely analyzed the final Payload. So let's try to shed light onto the C&C server. At first I want again to thank Chae Jong Bin! With his brief network analysis of this botnet, he gave me a solid background. The first thing you realize when visiting http://xlamzju-lrychj.info is directory listing was activated. This gives us the chance to explore files and folders. There are a lot of PHP Scripts, 3 .dat files and 3 subfolders. While searching for another interesting malware sample I came across a brief description from Chae Jong Bin of an yet unknown botnet. So thanks to him! I took a quick look into the executable and decided to do further analysis, because the Bot is implemented as a Windows Service and I haven't analyzed such an executable before. The first part of this analysis is about the "Static and Dynamnic Analysis" of the executable. Tools used are HxD Hexeditor, MiTeC EXE Explorer, OllyDbg, IDA Pro, Process Explorer and Wireshark. The second part deals with the C&C server(s) and its contents. While analyzing a malicious bot in OllyDbg (1.10) on my Windows XP SP3 Virtual Machine, I came across an odd exception (0x000006B0) which always occured trying to step over the Windows API function "gethostbyname()". Every time OllyDbg ended up in kernel32.dll after calling RtlRaiseException() (ntdll.dll). Because a search on Google doesn't gave me any answers I decided to find the cause on my own and hopefully solve the problem. While searching for some interesting, unknown malware samples I came across a report that took my attention (http://www.threatexpert.com/report.aspx?md5=9c0744b8119df63371b83724bafe2095). The malware has an user-mode and a kernel-mode component and looks like a legit program at first (.sys + .inf files). By typing one of the created registry entries (NdisrdMP.ndi) into the search mask I discovered several reports of earlier (and also widely detected) versions of this family. By looking at the dates, the first uploaded sample is from year 2009, so this malware family is at least used since then. Unfortunately I hadn‘t access to the Threatexpert database, so I contacted rkhunter from kernelmode.info if he could provide me a copy. So thanks goes to him! This paper is about Static Analysis of the Dropper of this malware. 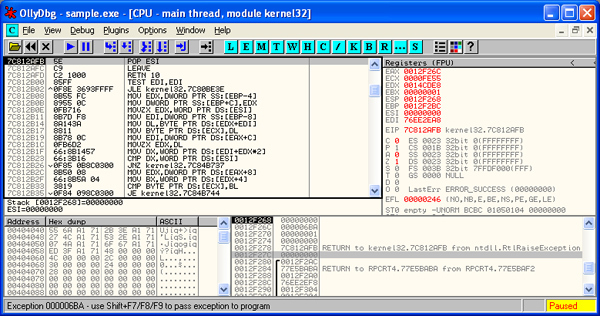 You can find the rest of the analysis (Kernel-mode Payload + Additional Components) on rkhunters‘ Blog at http://artemonsecurity.blogspot.com/2012/07/investigation-interesting-kernel-mode.html.